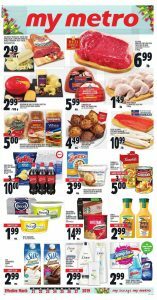 Metro Flyer Weekly Deals 25 Mar 2019 is the good choice for this week. Daily deals and weekly deals waiting for you inside this flyer. Look up and find your favorite healthy food opportunity here and save your money today. If you are hungry and do not have time, visit the fresh rayon. You will find ready trays !